This is a new article attempting to explain the real reasons for Caiph al Ma' mun's strange forced tunnel into the Khufu pyramid. The classical story of the discovery of the upper chambers inside the Great pyramid at Giza is well known. In the ninth century an Arab governor of Cairo, known as the Caliph al Ma'mun, decided to see for himself what lay inside the Great Pyramid (Khufu pyramid) and began to excavate a tunnel bodily through the casing and core blocks with hammers and chisels. Fortuitously for the Caliph, their busy tunnelling shook the structure so much that the capstone fell off the end of the ascending passage. The resonating crash was heard by the workers, who dug in that direction and found not only the descending passage, but also the ascending passage and all the upper chambers in the pyramid. After thousands of years lying undisturbed deep inside the Great pyramid, the King's and Queen's chambers were opened at last and their treasure would soon belong to the Caliph. But, as the story goes, there was no booty; apparently this most ancient and precious of cupboards was absolutely bare. There were not only no burial artifacts, but no burial and no inscriptions either! The first thought to cross the mind of the Caliph must have been that the 'tomb' had been robbed, but how? Even if the secret 'Well Shaft' deep inside the pyramid had been found at this stage, it is hardly a suitable tunnel through which to strip a wealthy burial chamber totally bare. So where was all the loot? The Caliph and his excavators must have not only been very exasperated, after all their work, but mystified too. Are we so sure that this is what really happened, just over a millennia ago? Are we simply complacent because this it what has been taught to us by respected authorities for centuries? Perhaps it merely easier to agree with the established consensus of opinion, rather than thinking positively and laterally about the problem. Fortunately there are a few individuals out there, who are more than happy to challenge a whole raft of classical myths; and so it was one day that a short e-mail arrived in Ralph Ellis' in-box from a like-minded colleague, Mark Foster. Mark had an idea that had been bothering him for some time and he wanted to throw it around a bit. A quick read convinced Ralph that it was a highly original idea and definitely worth some further thought. After a few debates here and there, the following alternative scenario to the classical story developed, which is quite attractive in many respects. The new explanation not only answers some irritating puzzles, but it also poses some interesting and fundamental questions in return. As Mark explained, the basic problem with the classical explanation was that Ma'mun's tunnel is rather too accurate for comfort, it tracks into the pyramid in a direct line for the all important junction between the descending and ascending passageways. It is often cited that Ma'mun had to turn the tunnel sharp left to discover the original passageways, a fact that Ralph and Mark had in the back of their minds when they first visited the Great pyramid. But as Ralph and Mark ambled down the forced tunnel, they were both equally rather mystified, because the 'left turn' cited in the literature could not be found! Having backtracked the tunnel and tried again, that 'left turn' seemed to be no more than a slight widening of the tunnel at this point. In actual fact, the diggings were almost right on their target. So how did this happen, was Ma'mun just lucky and happened to pick the right spot? Did he have an idea of where to go to? Strabo seems to be describing a door made of stone that is movable in some way, it can be moved upwards and outwards at the same time. This sounds like a hinged flap arrangement, with the hinge at the top of the stone. Strabo was clearly familiar with the internal layout of the lower portions of the pyramid, he calls the rough hewn hole there the 'foundations' rather than the more obvious term of 'chamber' and he is also familiar with the form that the entrance stone took. Behind these sockets, the passageway contained more door sockets. These were smaller vertical sockets, for a very lightweight door, perhaps made of wood and presumably to keep out the wind-blown sand. Fig. 2 Great pyramid's entrance closed. Fig. 3 Great pyramid's entrance open. 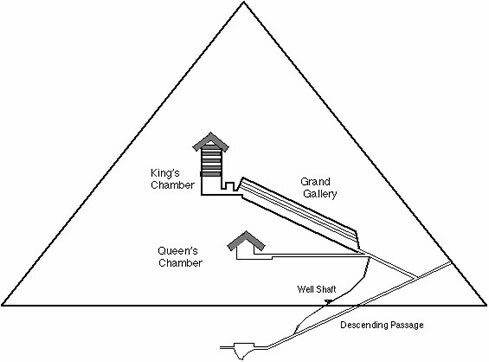 The diagrams above were developed by Petrie and based on his analysis of the Vega (Bent) pyramid entrance. The hinged stone door is clearly marked as the large shaded stone. It needs to be this shape, with a long top extending backwards, in order to counterbalance the weight of the stone. The amount of counterbalance at the top would have been judiciously arranged by the architect, so that the force required to open the stone was within normal human limitations, say about 25kg of force. Here then, we have clear evidence that a movable entrance stone was fitted to the Great pyramid, and that the descending passage had been visited, perhaps many times, throughout recorded history. To gain entry to the pyramid, however, was still not easy. A series of ladders would have to be erected against the pyramid to reach the door. Presumably the entry stone must have had a handle of some sort on which to pull, and it would then need a prop of some nature to keep it open, while the new initiate scrambled into the thin hole and down the descending passage. A knotted rope would also have to be fed slowly down the length of the passage, to allow for an easy exit from the dark and foreboding depths of the sacred pyramid. The question is, therefore, why could Ma'mun not see these tell-tale marks and the original entrance to the pyramid that lay only a few meters above him? Why could he not see the handle on the door, or the scuff-marks on the smooth exterior? The knowledge of the true entrance must still have been known, so why could none of the locals be 'persuaded' to point it out? This apparent invisibility of the original entrance could not have been because it was covered by sand, for instance, because Ma'mun's tunnel lies below the level of the real entrance. So what was the problem? Why so was much effort expended in digging a new tunnel, when an easy entrance lay just above? Two very important questions have just been posed - why could Ma'mun not see the real entrance, when it was so well known? And why was his alternative tunnel so accurate, if he did not know where the real entrance was? Bit of a catch-22 really. Mark Foster had had an idea that Ma'mun already knew of the original entrance and the descending passage, and had used the new forced entry tunnel for another reason - perhaps to get around the granite plug-blocks in the ascending passage, perhaps to get the necessary equipment into the right position to dig around those blocks. But if Ma'mun did not discover the ascending passage while he was creating his new forced tunnel, how did he know it was there? The ascending passage was, after all, completely secret and unexplored at this time, so how was it discovered? Mark and Ralph both came to the same conclusions on this topic. The key to discovering the ascending passage lies outside the pyramid, just to the east of the base and to the north of the causeway. Here, there lies what Petrie called the 'trial passage', which is simply a foreshortened replica of the Great pyramid's descending passage and the junction with the ascending passage. As everything on the plateau has a purpose, why is it there? Petrie thought it was a test-bed on which the architect could test out the procedures for laying out the internal passageways to the pyramid. This is a possibility. However, we both think that the real answer is that it is not a 'trial passage', but a 'guide passage'. Any interested party looking into this short passage system will clearly see the symmetry with the real descending passage inside the pyramid, but a little further down they will come across a junction with another ascending passage. The idea might just dawn on someone that the real pyramid passageways just might have exactly the same configuration. Thus the ascending passage was quite possibly found by Ma'mun's men entering the original entrance to the pyramid and tapping down the ceiling of the descending passage, searching for that elusive passageway that was hinted at by the 'guide passageways' outside. Success at last, the men found a concealed entrance! But as they were not able to penetrate the granite plugs that blocked this ascending shaft, a small tunnel was dug through the softer limestone core-blocks, around the granite plugs, and up into the ascending passage. Ma'mun was at last able to enter the Queen's and King's chambers and to plunder his expected booty. If all this is so, however, it may also be an indication of another passageway inside the Great pyramid. The only difference between the 'guide passageways' and the real passageways, is that the guide system has a vertical shaft attached to the junction of the descending and ascending passages. Mark believes this to be a sure sign that a similar vertical shaft lies undiscovered within the Great pyramid - it is a distinct possibility. It is highly probable that the real reason for the forced tunnel was not to get into the pyramid, but rather to get 'something' OUT. Whatever it was, though, it must have been small enough to go down the first part of the ascending passage, but it was too long to go around the bend between the descending and ascending passageways. The only alternative for the intrepid explorers, was to dig a tunnel directly outwards from the junction of the two passageways, bypassing the internal passageway constriction. This explains both of the questions posed above. The original entrance had been known about and used, and the accuracy of the forced tunnel is now also obvious, because is was started from inside and dug outwards. This may also explain why so much rubble was later found in the bottom of the descending passage, it came from the forced tunnel's excavations. So what was the long thin booty that Ma'mun had found and 'liberated'? Had the King's chamber been filled with sacred and valuable artifacts and the mummy of a great and ancient king? Had Ma'mun discovered a king's ransom in bullion? Perhaps, but personally Ralph thinks that the real answer is probably more prosaic and poignant that this. Ma'mun laboriously climbed his way up the 41.2 cubits of swaying ladders, to the original entrance of the Great pyramid, a difficult task for a well-fed Caliph and a worrying moment for his advisors. After a short slide down the descending passage, he entered the small rough shaft that his men had dug around the granite plug blocks and scrambled into the ascending passage. From there he struggled up the Grand Gallery, his men cautiously pushing his bulk from behind. Sweating and cursing, he finally crawled on hands and knees into the King's chamber, a degrading and exhausting experience that no Caliph had endured either before or since. Ma'mun was flustered, even angry, but also elated. Although he had been briefed that the King's chamber was basically empty, what it did possess was an untouched, enigmatic and completely sealed sarcophagus! This was the prize that justified these privations, Ma'mun was going to be at the opening of this sarcophagus at whatever cost - he was not about to let his chief vizier run of with the treasure of the ancient kings, or perhaps even the secrets of the gods themselves! A disorganised rabble of workmen arrived and prised at the coffer lid with crow-bars; they cursed, swore and shouted, but the lid just would not budge. Finally, in a state of ecstatic anticipation, Ma'mun pushed the rabble aside and ordered the coffer to be smashed with sledge-hammers. The chief gaffir aimed a few heavy blows and with a great crash, one corner of the sarcophagus flew off - the result still being visible today. Ma'mun ordered the workers away, yelled for silence, grabbed a flickering lamp from a soldier and approached the hole in trepidation. Then, the significance of the moment struck him. He was standing inside the greatest of all the world's ancient monuments, a structure rumoured to have been constructed by the gods themselves. Here at the heart of this sacred monument lay a simple, unadorned, solitary black-granite coffer, that had been sealed for thousands of years; and he, Caliph al Ma'mun, was going to be the first to see inside. His hand began to tremble at the thought and he quickly steadied it with his other, least the workers see him as apprehensive. The light flickered and it was difficult to see, but at last it steadied and he saw for himself that the sarcophagus was ....... empty! This is exactly what happened to the archeologist Zakaria Goneim a millennium later. He was excavating the pyramid of Sekhemkhet at Saqqara, when a sealed sarcophagus was found complete with its 'funerary wreaths' still on the top. With great difficulty the sliding end of the coffer was raised and it was ...... empty! Whilst Zakaria Goneim was greatly disappointed, the Caliph Al Ma'mun was absolutely livid. Suspecting, perhaps, that one of his workers had manufactured this little rouse, he flew into a violent rage and vented his anger on a few unfortunate victims of summary justice. Ma'mun, however, was not about to go back to his palace empty handed, after all he had been through. But the chamber only contained the sarcophagus and it was quite obvious that it was bigger than the entrance to the chamber. As a consolation prize, they found that the lid of the sarcophagus could be turned diagonally and just about squeeze through the King's chamber's tough granite entrance blocks. Ma'mun was going to have it as a memento at all costs. Unfortunately for the workers, however, after sliding the great block of stone down the Grand Gallery, they found that the lid was not going to squeeze around the plug blocks and into the descending passage. Besides, the lid must have weighed a tonne, and if it ever got into the descending passage, nobody could think of a way of preventing it from plunging all the way down to the bottom of the pyramid. In addition, the original entrance stone-flap was far too small to get the lid through. It was all becoming a bit of a nightmare. Spurred on by an enraged Caliph, however, the chief of engineering came up with an answer. The only practical solution was to force a new tunnel from the junction of the descending and ascending passageways, horizontally through the core blocks of the pyramid and into the open air. THIS is Ma'mun's forced tunnel. Ralph Ellis and Mark Foster have asserted their rights, in accordance with the Copyright, Designs and Patents Act 1988 to be identified as the authors of this work.